The curricula of undergraduate programs of BJTU consist of 4 modules, i.e., Basic Courses of Humanities and Social Sciences, Basic Courses of Natural Sciences, Specialty Courses and Elective Courses. The basic curriculum module of humanities and social sciences attaches great importance to the cultural quality of students, which includes public elementary courses and quality cultivation courses. 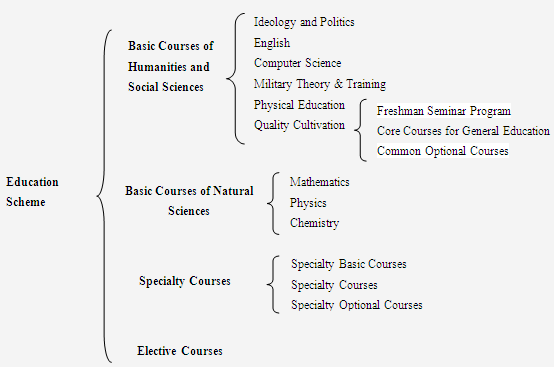 The basic curriculum module of natural science pays attention to constructing a profound basis of natural science knowledge, which includes mathematics courses and physics courses, chemistry courses offered by part of engineering majors. Professional courses module focuses on the cultivation of solid foundation of subject knowledge and professional practice ability of students, which are composed of professional basic courses, professional courses and module curriculum of professional emphasis. The independent selective module places emphasis on individualized development, which includes optional subjects and innovation credits, providing interdisciplinary courses or scientific research training participation, discipline competition, academic thesis, patented invention and certificate assertion for students.